Sports anime has never really caught on in North America, leaving quite a few series unlicensed and others as streaming only releases. In Japan sports manga and anime adaptations happen fairly often, and one of the bigger names in the 90s was Slam Dunk. 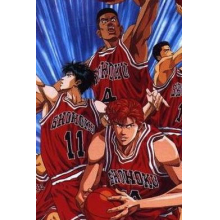 The Slam Dunk manga ran from 1990 to 1996 and found a good deal of success in Japan and other parts of Asia, which was enough to greenlight an anime adaptation from Toei. This adaptation aired from 1993 to 1996 and had 101 episodes, with four short films produced that added some additional games and storylines. Genon and Toei briefly tried to bring Slam Dunk to North America in the early 2000s but it was a commercial bust and now the only way to watch the series in subtitled form officially is through Crunchyroll (the four films remain fan-sub only to my knowledge). It’s a lengthy series, but if you’re interested in both anime and sports and haven’t seen this one yet is it worth the time commitment? After finally finishing the series and watching all of the movies, my answer to the above question would be yes, provided you don’t try and marathon the entire run too quickly. Slam Dunk tells the story of Hanamichi Sakuragi, your typical high school delinquent that spends most of his days getting into fights and leading a gang. He’s easy to spot with his red hair, and also has a long standing record of being rejected by every girl that he has ever confessed to. Despite this consistent string of failure when it comes to love, Hanamichi finds a new interest one day when he meets Haruko Akagi. Haruko has an almost obsessive interest with basketball, and in an attempt to win her over Hanamichi ends up challenging the captain of the Shohoku High School basketball team to a match. He doesn’t know anything about basketball but wins the duel by essentially knocking the captain out on accident, only to find out that he is Haruko’s brother. In a continued attempt to woo Haruko’s affection and finally succeed in love, Hanamichi ends up joining the basketball team, and is accepted despite his brash personality due to his athleticism and tenacity. Right from the beginning, Slam Dunk had my attention. The combination of high school delinquents, basketball, and just a hint of potential romance threw everything I liked together into one anime and Hanamichi’s ability to flip flop between a badass and completely silly high schooler when it came to romance made him a likeable lead. The first part of the series focuses on his transformation from a reluctant member of the team who is only doing it too woo Haruko to a legitimate basketball player, and along the way viewers meet the other members of the team. Despite being a complete novice at the sport, Hanamichi is extremely competitive and when challenged has the ability to come through, which makes him an asset to the team. Initially, viewers meet Akagi, Kogure, and Rukawa. There are other members of the Shohoku High School basketball team, but these three are the ones that are given the most character development. Akagi is the team captain that Hanamichi challenges early on, and he is quickly given the nickname Gori due to his large stature that some on the team equate with a gorilla. Despite his size and sheer athletic ability, Akagi’s actually pretty smart and serious with his studies, but it has been his dream to go to the Interhigh Tournament and make Shohoku the national champions. Kogure’s the most normal on the team, but is able to keep some of the tempers in check and gets his opportunities throughout the series to help contribute to their success. Three additional members are added into this core cast after a few episodes, as it doesn’t take long for Hanamichi to meet point guard Ryota Miyagi. While they initially clash, the two bond over failed love and become friends of sorts. Ryota’s madly in love with the team manager Ayako, who constantly refuses his advances, but he has great athletic ability and makes up for his smaller stature with incredible speed. The ace of the team is freshman Kaede Rukawa, who literally breathes and sleeps basketball and shows little interest in nothing else. Haruko has a crush on Rukawa, which immediately makes him Hanamichi’s sworn rival and there is a lot of banter between the two during each episode. Finally, Hisashi Mitsui rejoins as a talented shooting guard after initially trying to destroy the basketball team in what is one of the best school gang fight scenes I’ve seen in an anime in some time. Between Hanamichi, Ryota, Kaede, and Hisashi there are a lot of hot tempers on the Shohoku team and this leads to plenty of conflicts. But each one is given a good deal of background development and focus throughout the 101 episodes, making it so you can’t help but root for them despite their rougher exteriors. While three quarters of the series is focused on the actual basketball games, there are plenty of in-between moments that have more of a slice of life feel. In between the games and the team training, there are lots of cuts to each of the members going about their daily lives. There’s plenty of high school delinquency on display, especially early on, with the constant fights between gangs making Slam Dunk feel different from your average sports anime. But there’s also quite a bit of comedy as well, particularly when Hanamichi’s gang is involved. His gang of friends like ribbing him and have a tendency to cheer whenever he does poorly in a game, which happens quite often since he is a novice at basketball. The combination of intense basketball games, comedic moments, and slice of life works well and makes the series engaging to watch. It may be a typical story of a rag-tag bunch of guys coming together to triumph in a sport, but as the episodes progress the characters begin to grow. Hanamichi becomes more in tune with basketball and actually gains some skill rather than solely relying on guts and physical prowess, and you get a sense that each of the supporting characters on the Shohoku team change from the earlier scenes to the end. One of the main reasons that I like watching sports anime and sports in general is because of the storylines that end up happening, mixed in with plenty of raw physical talent. This is where Slam Dunk truly made an impact, as not only do viewers get to spend plenty of time with the Shohoku team and learn each player’s aspirations and struggles, but they also get plenty of focus on the members of the teams Shohoku will be facing on their path towards the national championship. Kainan, Ryonan, and Shoyo all serve as the main adversaries standing in the team’s way, and each one has some star players that the series focuses on. Players like Kainan’s Maki and Ryonan’s Sendoh are very charismatic and able to keep their cool under pressure, making them tough adversaries, while others like Nobunaga and Uozumi are much louder and aggressive like the Shohoku plauyers. Slam Dunk spends some episode time diving into some of their back stories and showing some everyday interactions between these characters as well, and they’re developed well enough that I found myself wanting to root for them had they not been playing against the main cast. Even in a sports anime, it’s rare to have the opposing teams/enemies developed to the point that they’re almost as likeable as the protagonists. Despite the amount of time spent developing the characters and the fast paced basketball action, Slam Dunk does become fairly repetitive and as a result it’s a series best watched over a lengthy period of time rather than in a quick marathon. As you might expect from an anime that has 101 episodes, the matches are all fairly drawn out and often suffer from what I like to call the Dragon Ball Z problem. Similar to how fights in Dragon Ball Z might stretch from one episode to the next, with one attack taking an entire episode to pull off, one specific play in a major match in Slam Dunk takes just as long. There’s one episode during one of the matches that focuses on Kogure making a game changing play, but instead of simply letting him do so the series goes into a flashback showing his entire contribution to the team up to that point. Since things are so drawn out there are some points where you’ll just want the matches to reach their natural conclusion rather than being stretched on any further, and this is the one major problem that held the series back for me. It’s pretty clear when watching Slam Dunk that it’s a 90s anime, as the overall look is fairly close to a lot of the other anime and manga from the same time. Toei did a decent job of bringing the basketball games to life, and while there is inevitably quite a bit of repeated footage the quick cuts make the action feel very fast paced and grab the viewer’s attention. A lot of the tricks used to showcase motion are common for the time period, and while a lot of them do age the show I don’t think that it has aged particularly poorly and still has enough of an eye catching look to interest the current generation of anime fans. In between the basketball matches the animation has that typical 90s slice of life look, with characters moving between slightly more realistic designs and exaggerated ones that fit their personality. While I wouldn’t necessarily say that all of the animation elements were the best when the show was brand new, Toei maintains a consistent look and feel across all of the episodes and it felt like they were delivering consistency and an occasional burst of flashiness when the basketball games reached their conclusion. Slam Dunk keeps the same opening for over half the series, and “Kimi ga Suki da to Sakebitai” by Baad fits the overall tone of the show perfectly. The more lighthearted feeling of the song made me feel like I was about to watch the anime version of a 90s sitcom the first time I saw it, and as someone who watched quite a few of those when I was younger that was instantly appealing. This is also true of the ending themes, which change a bit more frequently and alternate between slightly edgier tunes and lighthearted numbers. But what I like the most would have to be the voice acting, as the main cast does a fantastic job. Takeshi Kusao brings Hanamichi’s character to life, and his versatile performance perfectly reflects the shift from tough guy to goofball depending on the situation. This is also true of the other voice actors, who are able to sell the tough guy attitude but also showcase a lighter, more humorous side that makes their characters easier to connect to. I did find that a few of the minor characters had voices that were a bit grating, but it never became a big enough issue that I wanted to stop watching. Although it can become repetitive fairly quickly if you watch too many of the 101 episodes in rapid succession, the intense basketball matches and likeable cast of characters will keep you wanting to see what happens next in Slam Dunk. It’s great to watch Hanamichi face trial after trial as he commits to basketball and gives it his all, and I can see why this particular anime had retained a dedicated fan base after all these years. Despite the fact that sports anime still remains a niche within a niche over here in North America, I hope that people like myself will continue to discover this series and appreciate how it can generate interest in the sport while also offering engaging drama and slice of life elements.